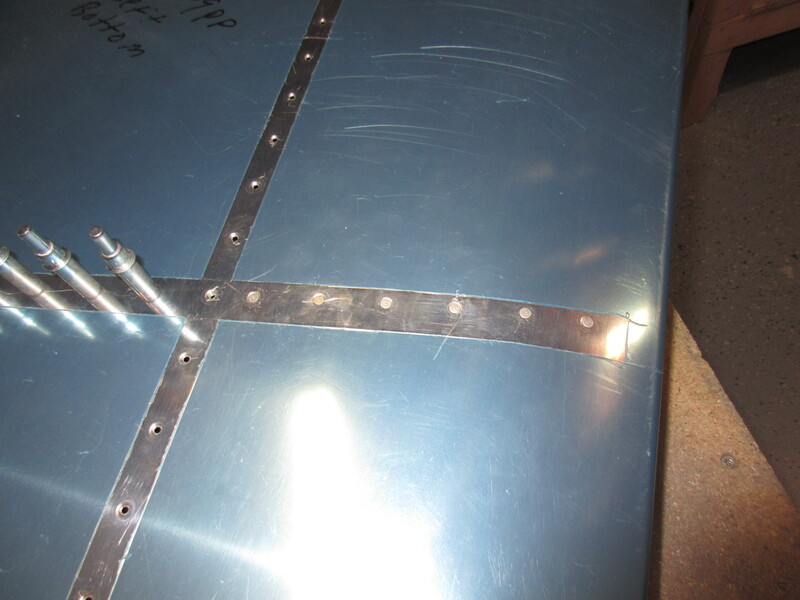 Tonight started off by riveting the HS-00005 and HS-00006 ribs to the HS-702 front spar. I was able to use my squeezer to set these rivets, but only just barely! I had to do some finagling around the front spar support bars, especially the larger HS-714 to get the squeezer to line up on the rivet heads. I did have to insert two rivets in the opposite direction in order to set them, but other than being cosmetic it won’t hurt anything. After completing the front spar, I moved on to the left HS-601PP skin. The plans have a unique way of final assembly, and after reading over the plans, and visualizing what would take place, I dived in. This method is a bit different than the George Orndorf method I watched in his videos, but I am not using a RV-6 jig. 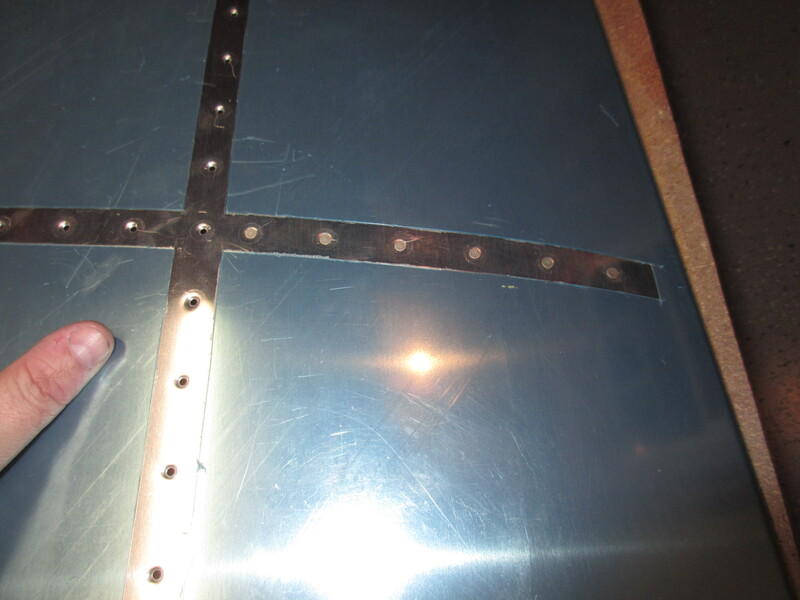 It starts off my clecoing HS-707 nose rib to the skin and then riveting it. After making sure everything looked good and flush, I riveted the rib to the skin. This was the first official piece of work that I riveted that would be seen from the outside, so I went slow and took my time. I was happy with the results! 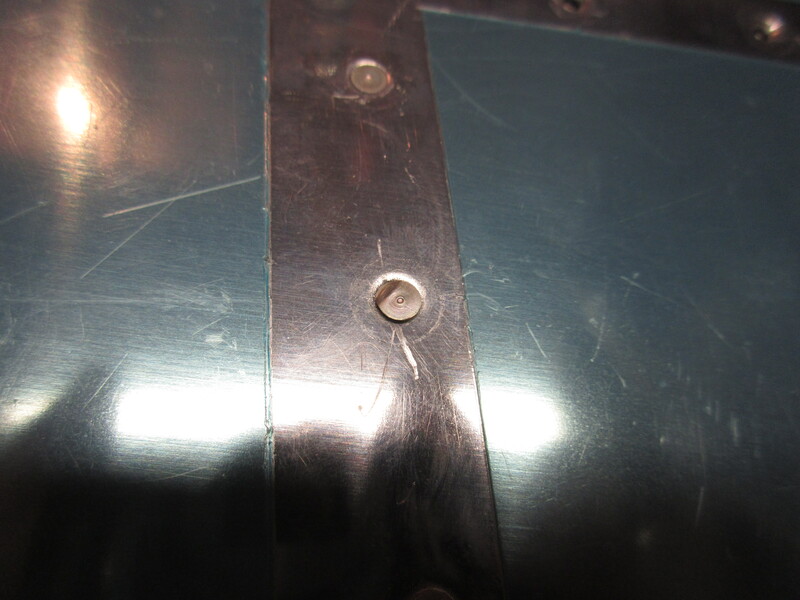 And this was the first ever flush rivet to be set! After riveting on the HS-707 nose rib to the top skin, the plans have me cleco the end rib, HS-706, to the skin, as well as HS-708 to help hold everything tight. This makes riveting HS-707 to the bottom of the skin much easier. 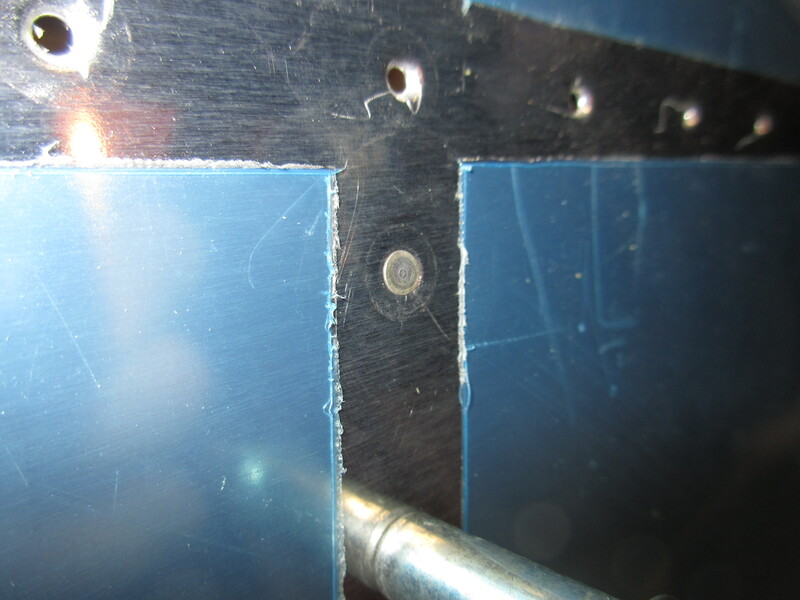 HS-707 nose rib was a tricky part to rivet! I messed up two rivets so I had to drill them out and replace them after I got all the other rivets done. I have practiced this on scrap material a bunch of times, so it was no biggie. 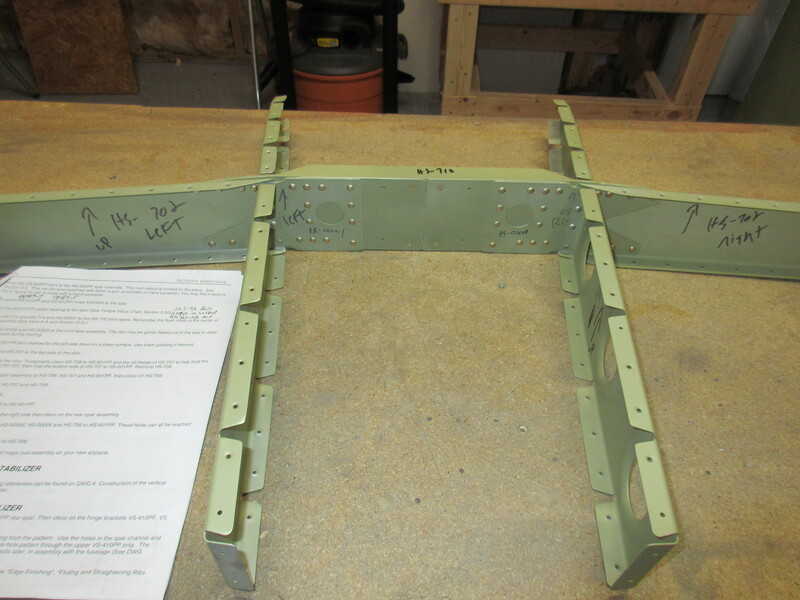 Once I had both sides of HS-707 nose rib riveted and done, the next step was to insert the front spar assembly so I can be riveted in place. So I got it all situated, and made sure everything was lined up and clecoed every hole to hold it in position. 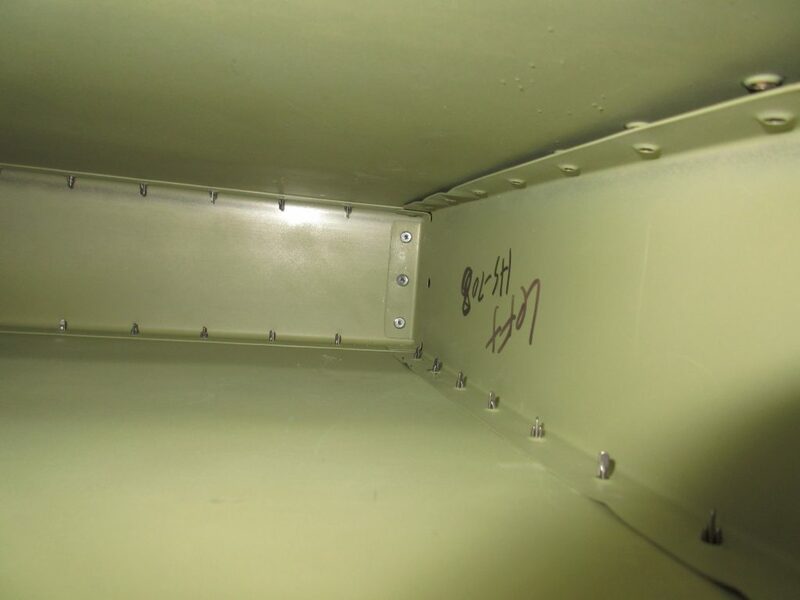 Once the front spar was fastened, the plans have you use a blind rivet (pop rivet) to hold HS-707 nose rib to HS-702 front spar and HS-708 middle rib. These rivets were a little tricky because the space is pretty tight and I have big ole gorilla hands. Not to mention the head of my pop rivet squeezer barely fit between the rib and the rivet mandrel. But, after some patience and a little wiggling, I was able to fully seat the three blind rivets that holds those two ribs to the front spart assembly. As a side note, I learned from the Vans Airforce Forums that a good trick to protect your skins during riveting is to wrap your bucking bar in athletic tape, except for the tiny bit you are using against the rivet tail. This is a really good suggestion, because it helps you hold on to the heavy bucking bar, AND protects the primed surfaces from getting scratched up from the sharp edges. 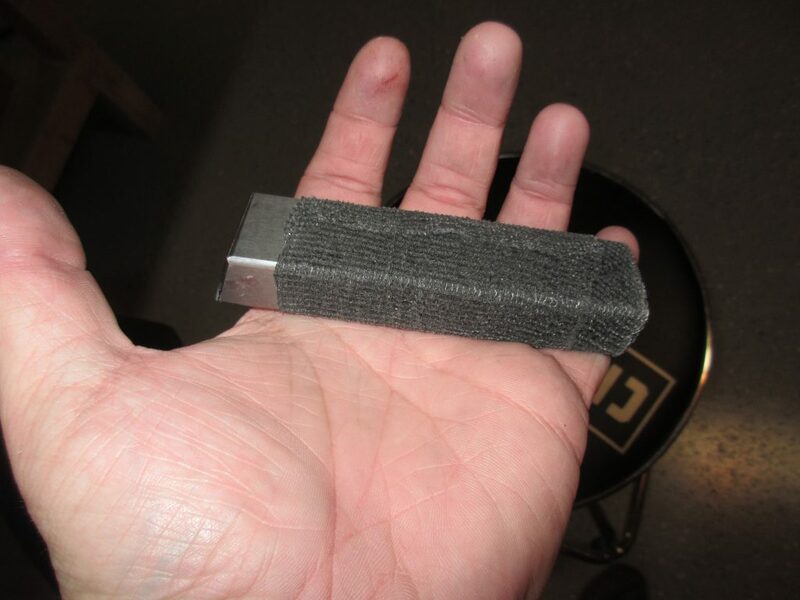 Since the athletic tape doesnt stick to anything but itself, it leaves no residue on the bucking bar! Thats all for tonight. A little over 3 hours of work and I have my left horizontal stabilizer partially riveted and ready to finish up. I will leave the other work for another session when I am a bit more refreshed and ready. Here is an album of all the photos, some showing better detail of the work.